Newfound Cottage ~ Swimming pool/hot tub/outdoor fireplace/onsite hiking!! Thank you for visiting the listing of Newfound Cottage!! ... MapQuest/GPS will not direct you to the cottage, but directions we send provide crucial physical markers that will. ...... WE ALSO GIVE DIRECTIONS TO GROCERY STORES BEFORE AND AFTER ARRIVAL, PARKING AT OUR COTTAGE ... AND A FEW OTHER THINGS ... YOU NEED TO KNOW MORE THAN JUST THE ADDRESS. •• pool is open only in the summer ... thus why summer rates are higher and ... it's too dang cold to swim here any other time!!! .... Four-wheel drive is suggested pending/anticipating snow but is not required to rent. .... Because the cottage is located 1/2 mile on the side of a mtn. with 100' of that being a 20° gravel incline, we suggest winter guests check our zip code  no more than 3-4 days prior to arrival to check for predictions and/or accummulation of snow. If a significant accummulation is predicted, guests should drive a four-wheel drive vehicle, bring food with them, and plan to stay at the cottage for their own safety. We do not give refunds because it's snowing. ... Because my rates cover 6 people, and everything else is still provided at no extra charge, there's no discount for not supplying sheets or towels. .... unlike staying at a hotel or going to a community pool, you have our pool all to yourselves. ... We never use the pool when occupied by our guests. ... My family uses the pool at night. ... The pool is located at our house for ease of maintenance - because we live on the property we can check the pool every day - and it had to be a certain distance from the cottage's septic field. ... For any inconvenience walking 330' to the pool may pose we have kept our rates extremely low compared to other rentals offering pools physically connected to the house. Newfound Cottage is located west of Asheville in Leicester in the community of Newfound on Newfound Rd. Once you take the Newfound Road exit and start your 5.7 mile drive to our road, you can easily see the incredible valley as you come down Newfound Mtn. There's no other area in WNC that presents such a view upon entrance as the area of Newfound! And this area being a farming community, houses are acres apart, not 20' from each other. Newfound Cottage is only 8.7 miles from the Asheville City Limits [via in-town roads] and only 20 minutes to downtown Asheville [via in-town roads]. This particular piece of mountainside is a 136 acre privately owned family farm, owned by my parents since the 1970s. The drive up to the cottage is 1/2 a mile long, so you can't see the cottage from the main road. We, the owners, live 2 acres from the cottage ■[see photo taken from front deck if cottage]. We're here to be helpful, keep up our cottage, amenities and property to our high standards, but you have complete privacy. We don't boast a grand view from the cottage, because it's setting offers the peace 'n quiet afforded by mountain wilderness. The slight view from the cottage's front deck is of the mtn. tops across the way ■[see photo]. The cottage is the last structure on our mountain, so there's complete seclusion on the back deck of the cottage with the hot tub and outdoor fireplace. Onsite hiking is available if you'd like to get out, stretch your legs, and see exactly what you have heard other visitors to this area say about being in the mountains. Visiting us in Summer means you also have a swimming pool only 330' down from the cottage ■[see photo]. 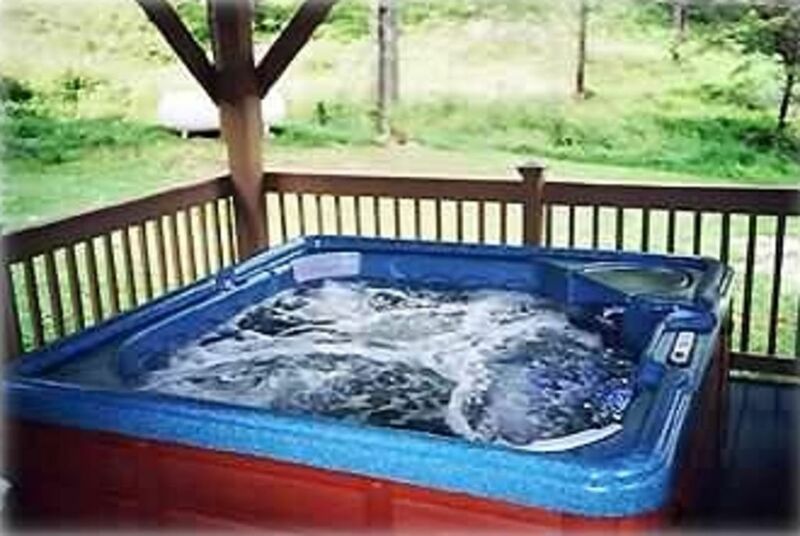 The pool not being physically attached to the cottage doesn't mean you won't be able to use it privately. We do not use the pool when occupied by our guests. And we have found it very easy for our guests and our family to use the pool at completely different times of day. Besides the onsite hiking, hot tub, outdoor fireplace and swimming pool, the cottage offers 3 bedrooms and 3 bathrooms with 2 bedrooms being suites - one is on the main, the other upstairs. The 3rd bedroom upstairs has one half wall [3 1/2 ft. high] behind the headboard of the bed making an open space allowing the heat and air-conditioning to circulate ■[see photo of 3rd bedroom] - we've never had guests have any problems with that architectural detail of the cottage - it's been that way since we starting renting in 2002. When waking at Newfound Cottage you don't get excruciatingly bright sun light through bedroom because of the wooded surroundings and upstairs bedroom windows face north, downstairs west. We have had guests with aging parents, small children as well as teenagers, find the accommodations at Newfound Cottage to live bigger than pictures let on. The inside offers a spacious living room and private upstairs, while the main floor has an open concept where everyone can socialize ■[see photo]. While offering onsite hiking, hot tub, outdoor fireplace, and swimming pool, 3 bedrooms and 3 bathrooms, the nightly rates reflect the 1400 sq. ft. size of the house as well as not having a formal dining room. We offer the high-end amenities some other more expensive vacation rentals do, but at much lower rates taking into consideration the size of the house. Come stay at the best vacation rental with the best amenities with the most reasonable rates in the mountains of western North Carolina .... Newfound Cottage!! □ 2 Guests will be provided linens and towels regardless of time rented. □ 3+ guests staying 3+ nights will be provided linens and towels. □ 3+ guests staying only 2 nights will not be provided linens or towels. □ KITCHEN: dishcloths, dish towels, scrub sponge/brushes, coffee, filters, sugar, non-dairy creamer, Splenda, Sweet 'n Low, tea bags, hot chocolate, salt, pepper, spices, cooking spray for grill, cooking spray for baking, dishwashing detergent, trash bags. □ BATHROOMS: shampoo, conditioner, body wash, bath mats, handheld mirror, hair dryers [every bathroom], fingernail polish remover, liquid hand soaps, bandaids, cotton balls, cotton swabs. □ cleaning supplies to disinfect counters, etc. My husband and I have been married since 1990 and have had both full time and vacation rentals since 1993. We're big DIYers. I am an artist by nature, so interior decorating comes natural to me. My husband has artistic skills too but prefers building things. We built our cottage with our own four hands over a 3 yr. period, every weekend, every holiday, and our own money. A vacation rental business suits me for being able to earn income from home while keeping myself available for my school-age son, having time for family/school activities, as well as being able to clean and maintain my vacation rental to my high standards. The community of Newfound in Leicester is a farming community. Since we loved the area enough to build our dream home here, we knew our guests would appreciate a home-away-from-home in a true country setting. Perfect location being 5.7 miles from the interstate, 20 minutes from downtown via in-town roads and only 25 minutes to the Biltmore Estate [via in-town roads]. So you get to enjoy time "vacationing" instead of driving. It's the best of both worlds! Relaxing in the mountain setting with lightning bugs and tree frogs at night, song birds during the day, being in a well maintained clean house, beautifully decorated, minutes from major attractions, while having simple amenities like satellite TV, WiFi, magazines, board games and DVDs in case of less than favorable weather. But also having the high end amenities like a hot tub, outdoor fireplace, onsite hiking and swimming pool when there's nothing but perfect weather in sight!!! • Main floor master suite offers full bath. including double sinks and private access to back deck. • Upstairs master suite offers a full bath. plus double sinks. • Downstairs bath. is a full bathroom with one sink. 20 minutes to downtown Asheville. Somewhat obscured, but the view over the treetops is of the mountains across the way. Central air-conditioning [in addition to ceiling fans]. Heat pump and Propane both. Linens provided .... EXCEPT .... 3 or more guests staying only 2 nights bring their own sheets and towels. Washer and dryer are a stackable unit. We provide laundry detergent. Outdoor fireplace, electric fireplace in living room, gas log stove in dining area [used during power outages]. Plenty of parking for whatever our guests may drive or be towing. Towels provided .... EXCEPT .... 3 or more guests staying only 2 nights bring their own sheets and towels. Satelite-based internet through HughesNet. May be slower than what you're use to if you have a hard-wired internet service. Full-size w/ice maker inside freezer. Gas range [works in power outages]. Oversized oven large enough to cook a turkey. It's a gas range. Coffee, dry creamer, tea bags, hot chocolate, spices, sugar, sugar substitute, salt, pepper, spray for grill. Dinnerware, cookware, silverware, serveware, coffee mugs, cooking utensils, and plasticware for use outside. Gas range, microwave, drip coffee maker, refrigerator, crock pot, blender, toaster oven, dishwasher, pots, pans, dishes, glasses, wine glasses, silverware, cooking utensils. Dining table seats 4. Bar seats 2. • One in living room • One built into TV upstairs m. bed. Fiction books, plus magazines like Southern Living/Better Homes and Gardens, Our State. Board games, deck of cards, puzzles. • Toys provided are geared toward early school-age children. • footballs and frisbees are provided for outdoor play as well. Big front and back yard for playing football [provided], playing tag, or throwing a frisbee [provided], etc. Front and back deck are covered and can both be used in any weather and offer seating. There are 10 or so steps to the front door, and 3 steps to the back door. Nothing inside accommodates a wheelchair, but all doors are 3' wide and there is a m. suite on main floor. Open Memorial day - Labor day. Owners and our guests can use the pool at different times of the day so everyone uses it privately. Owners family usually uses pool at night. Private - on cottage's back deck [see photo]. Available 24/7/365 and has a view of the outdoor fireplace. Starter paper products, Coffee/coffee filters/dry creamer, Flavored teas, Hot chocolate, Salt/Pepper/Sugar/Splenda, spices, Laundry detergent/Dishwashing liquid, Shampoo/Conditioner/Body wash, Trash bags, Radio alarm clocks, Iron/Ironing board, Wood/kindling/butane torch provided for outdoor fireplace, Totes to carry stuff to pool, Directions to nearby fast food/casual dining/grocery store, Brochures for local and regional attrctns., Brochure for nearest medical services, City and state maps, Books and magazines, Phone Book. Our stay was great. We loved how the house was set up and of course, the hot tub! Tammy addressed any possible questions we could have had before we even had them. Thank you for a great stay! What a charming and great place for a get away. My children(teenagers) and I arrived on Wednesday and it was heavenly! The fireplace on the covered deck was definitely one of the best parts of our stay (I love a fireplace!). Everything was there for us to build the fire, warm ourselves at a safe distance, and enjoy some good ole conversations! I can't imagine getting to the cottage in the snow without 4 wheel drive. It is on the side of a mountain and the view is gorgeous in the morning! We were there during a rainy section, but it didn't keep us from enjoying the time away. Only issue was that we couldn't do any walking trails because of the weather. However, they were there identified and I would have enjoyed exploring the starting point of the creek that ran behind the house. With the fire going, the rain falling and the creek running along the back, the sounds were definitely soothing! There was even a grill that we used on the covered deck on the last night. The hot tub was definitely something to enjoy as well at night! I can't imagine anything that we needed to have that we didn't have access. The owners were up front with expectations and no issues at all! My teenagers loved the bedrooms. My son wanted to move the house (cottage) back home! My daughter loved the lofted style bedroom that she slept. Wonderful place to just unwind and enjoy! Thank you ever so very much for taking the time to write such a detailed review! Wonderful to know you used everything and found it all convenient. We know expectations can run high prior to arriving at a vacation rental not truly knowing what to expect. But we're glad we met those expectations. We do think the back deck of Newfound Cottage is a little piece of heaven as another past guest stated. The hiking trail is certainly something to be enjoyed in better weathet, but maybe a return visit will be in your future plans. Thanks again for your review and we hope you can return some day. This is truly a very cool house. The setup inside is cozy and great. The bathrooms are all lovely and there are plenty of towels. When we were looking for a place, the hot tub sold us on it and it certainly delivered. They provided fresh fire starters daily and re-filled the wood once. We spent almost every night out there. There are hiking trails close. And you can get to pretty anything in Asheville in less than 30 minutes. Again, really lovely house, great area, nice and quiet, and close to Asheville. They lay-out was great and our kids loved it. Thank you for the stay. We would like to thank these guests for the nice compliments about Newfound Cottage! Unfortunately,however,we need to address two untrue statements.First being-"there seems to (be) notes all around reminding people of the rules".We have one note in a kitchen drawer saying please don't take our pens and one in a cabinet saying please stack these bowls only four high.Not notes all around.Only one past reviewer,not multiple guests,stated we were particular.Rather odd to consider a request/reminder from the homeowners particular.Second untrue statement-"he said that they usually empty and re-fill it every couple days".That statement was never made verbally or face-to-face in any communication with these guests about the hot tub.The hot tub water was changed before they arrived ready for use by the morning of their afternoon arrival.Normal use you don't change hot tub water every couple days.They used the hot tub 5 straight days prior to their last day.We know the hot tub was used 5 straight days because we check the hot tub every day of a guests stay with test strips that indicate whether chemicals have been depleted and more need adding.More chemicals had to be added every day of their stay.It was explained to these guests on their sixth day through texts and verbally face-to-face draining and cleaning the hot tub water was necessary by their sixth and final day for their health and welfare because the water at that point was unusable.They had simply overwhelmed it.There's no way to know ahead of time when hot tub water will be overwhelmed and need changing.So it was OK to bring them more fire wood and kindling when we saw those were low,but not ok to drain the hot tub for their welfare when it was unusable.Spinning part of a review negative with two untruths as though a victim of some horrible foreseeable injustice,simply because the homeowners couldn't magically make the hot tub water usable by 6 guests a sixth day,comes across as completely ungreatful for owners who are engaged with their vacation rental and care about guests welfare. Our only issue was enough hot water.The house was charming and very specious. We were 6 adults. The hot tub was great! Location was great! We had coffee on the front porch and watched the sunrise. We're so glad these guests enjoyed their stay! The hot water tank is 40 gallons. It's the biggest we could fit in the crawl space. If 6 guests take showers one right after the other we're afraid that yes someone will get a cold shower. This is the first time in 16 yrs. we've had guests voice anything concerning the hot water though. We're so glad you got to see the sunrise. Truly a lovely sight here on the mountain. We hope you can make plans to return and see that sunrise from the front deck of Newfound Cottage again. Nice! Would definitely stay again. Nice cabin...no cell service and WiFi wasn’t working properly...but it was kind of nice being able to “go off the grid” not having to worry about social media and phone calls was able to enjoy the board games offered at the cabin and hot tub was a plus! Indoor heat wasn’t increasing in temp had one cold night! Which made for great s’mores and time in front of the fire! Thank you so very much to these guests for saying our cottage was nice and you would stay again! And playing board games gives a great chance to socialize sometimes you didn't really know you were missing. Cell phone companies concentrate on installing towers in more densely poulated places, which most of the time doesn't include mountains. The Wifi being satelite-based, where a signal traverses from space through Earth's atmosphere, is not going to be the same speed as a hard-wired service you can get in the city limits or 20' from a main road. Things aren't the same in the mountains as a city. These guests didn't contact us during their stay about unbeknownst problems with the HVAC. The heating system is both heat pump and propane. When I came up to the cottage to turn the outside lights off they left on their entire stay, and a lot of inside lights were left on too, I was overwhelmed with heat when I went inside. I went to the thermostat and it was set to 81° and the fan set to "circulate". The thermostat is always set to "auto" and a comfortable seasonal temperature for guests pre-arrival. When we go to the cottage after our guests departures, we have found the thermostat set exactly as we set it pre-arrival. That being said, why they felt the need to change it from "auto" to "circulate", I don't know. We were at the cottage both the day before and day of their arrival, and the HVAC was working great as usual. We can only assume they didn't know that to make the cottage warmer to simply increase the temperature. Sounds though that mishap with the thermostat was more than made up for with the s'mores and time at a fire in the outdoor fireplace. That's great! Glad they took advantage of another opportunity to spend some time with each other and being in the great outdoors! Thank you again for their compliments and glad they had a nice stay. The owners have done a great job decorating, stocking, and providing guests with information on the area. There are tons of games. movies, books, kitchen supplies, toiletries, fire starters... you name it and they have thought of it! They have also created such a relaxing oasis-- the back deck with the fireplace and hot tub was my favorite part. Yes, internet is spotty but when you're booking a cottage on the side of a mountain you have to expect that. I personally loved the lack of internet and cell service as it forces you to appreciate the surroundings . All in all, the trip was great! My only complaint is that the owner is very particular. I can understand as she is renting out a home but one instance left a bad taste in my mouth. One night we returned to the cottage in the early evening and some of us left again around 9pm and we did not return until 1 am. At 8:48 PM I received an email from Tammy saying that she hated to be a "fussy britches" but we needed to remember to turn off the lamp post when we are in for the night. HUH? 1. We were not all in for the night. and 2. IT IS DARK OUT THERE! Someone tripped the night that we checked in because no lights were on for us and so we opted to leave the lamp on that night to be sure it didn't happen again. She later sent me another email to disregard her last note as she noticed we had left and weren't in for the night but she assumed we were as we left some lights on inside. Like I said, someone stayed at the house so yes, lights were on. Maybe we are crazy but that left a sour taste in our mouths. I too own a rental property (two actually) and can appreciate her wanting to be protective of her home/rules as there are many people who are not considerate but at the same time you also have to respect the fact that people are paying money to relax and "live in" your home for the allotted time. We did not appreciate the babysitting regarding leaving a small lamp post on at night-- especially given she was incorrect. Seems like a tiny thing to be fussy about when we were extremely respectful renters. This certainly didn't ruin our trip and I am not writing this to deter you from renting this home (you should stay here!) but I do feel potential renters should know and maybe the owner can handle situations better for future renters. She was sorry the email "upset me" but never that she was wrong in sending it/assuming (which is the frustrating part). Thank you so very much for the wonderful compliments about our vacation rental!We very much do try to provide every little thing we think might be appreciated.Thus why one guest said "more like home".And yes, that back deck is a great place to relax and take in the scenery. [VRBO asks owners check only those activities that are only 15 minutes from their rental]. The following are either onsite or a maximum of 30 minutes from Newfound Cottage. Onsite hiking, 10 minutes to the Crest Center, 15 minutes to miniature golf, 15 minutes Tastee Freeze ice cream parlor (open in summer), 20 minutes downtown Asheville, 20 minutes to rafting, 20 minutes to Canton Park/playground, 25 minutes WNC Nature Center, 25 minutes to Asheville municipal golf course, 25 minutes to the Biltmore Estate, 30 minutes to Blue Ridge Parkway.